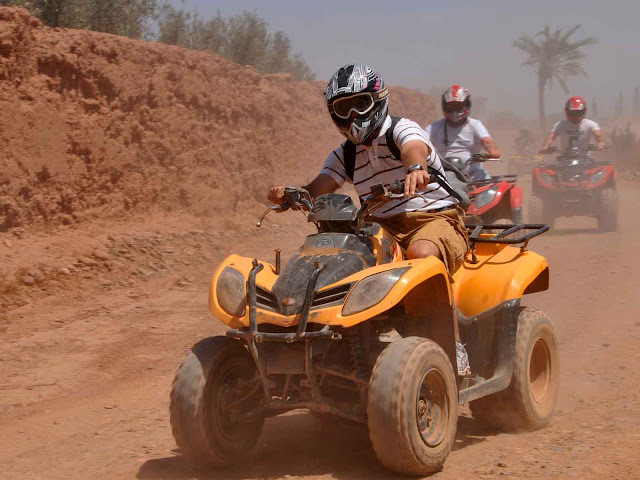 Destinations | Africa | Morocco | Marrakesh city | Marrakech-Tensift-Al Haouz Excursions | Quad bike Marrakech. Take off on a quad bike through the palm groves of Marrakech on this half-day tour. With a guide leading the way, rev up your quad and rumble through the Palmerai, the palm oasis that fringes the city. Weave between palms, roar across desert plains, and zoom by wadis and Berber villages, stopping for mint tea at a traditional Berber house. Your tour includes equipment and instructions, plus Marrakech hotel pickup and drop-off.